Your lessons are always free when you purchase a machine from us. With over 25 different sewing, serging and embroidery technique lessons to choose from you'll be comfortable with your machine in no time! 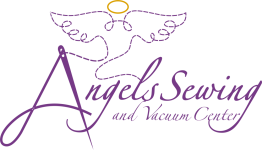 Open Sew at Angels is an opportunity for you, our customer, to get professional help with your sewing projects. Our instructors bring many years of experience and are very happy to help you figure out a difficult pattern, work through an unfamiliar technique or just lend some encouragement and advice. If you have a project you have not finished from Loreen's classes, you can join us for a Sewing Social time to finish those projects. The Big Shirt pattern is back by popular demand. This great basic shirt is made of multiple fabrics or not and you can add embroidery if you wish.... just have fun with it! The bell is ringing now for the start of the newest class from Anita's University, "In The Hoop 501". During this class you will be learning all about innovative in the hoop techniques. We'll cover a lot of different in the hoop projects like personalized tags, beautiful sun catchers and decorative lace wreaths. You've been asking and we listened! Mary Lou is offering a 3 month quilting class making the Yellow Brick Road Quilt. This is a super simple quilt using a rotary cutter and strip piecing that can be applied to many other patterns. Great for beginners but a quick quilt for those with a little more experience. Monthly table runners are a seasonal beginner friendly applique pattern. No matter what your quilt "skill level" is, you will love using these monthly patterns to create quilted treasures. Bought Essentials software and are ready to use it? Join us in this class to learn the basic of an easy to use software. These original designs and projects will take you through the process, step by step, in creating your own finished projects with complete directions. You'll learn editing right on your machine!!! We will be closed May 27 for the holiday. This adorable Bench Pillow design by Kimberbell will sure to be a hit for the Easter and Spring season! You can create this project by either using the Sewing and Quilting method or use the Machine Embroidery technique. Both patterns are available at Angels Sewing. This class will meet once a month for 3 months. Inspired by Edgar Allen Poe's poem "The Raven" this nine block quilt is perfect to welcome fall. This is a 6 month class.